Free delivery on orders over £49 to UK. Next working day delivery available (£6.49, order by midday, Monday-Friday). A perfect fit, so they don't slip, and they stay completely hidden under the lid. Extra-thick plastic and double-seam construction prevent rips and tears. One size does not fit all! Our liners are designed to fit each of our bins perfectly so there is no messy bag overhang or bunching – and they never slip. Extra-thick plastic and double-seam construction prevent rips and tears. Strong drawstring handles make the liners easy to lift, tie, and carry. Our liners are tailored to fit our bins perfectly so they don't slip, and they stay neatly hidden when the lid is closed. Extra-durable plastic and thick double seams prevent rips and tears. Easy to lift, tie, and carry. Dispenser pack opening makes it easy to grab one liner at a time — no perforations or unraveling. Excellent quality, slips out of the bin with ease, no mess .....and no fighting with the roll to replace with a clean one. The service was excellent and it arrived within 2 days. Why litres instead of circumference. Am I the only person who needs dimensions NOT liters? Please can we have the circumference of a bag. I would order more bags if I knew the circumference. We (simple human and I) have received several samples in vain. I bought my refuse can a few years ago and I'm really happy with it. Having liners fit precisely is what drew me to purchase it originally. I've since spread the message and hopefully brought a little simplicity into someone else's world. Great product. SO CONVENIENT PLUS PERFECT FIT! I love ordering the custom fit can liners in a quantity that will last a while! It's so convenient, and I never run out of the liners when I have a supply on hand. They fit perfectly, hold a lot, and I can't even imagine trying to substitute a plastic grocery bag if I were to run out of the liners. I might also add that your delivery service is outstanding! Thank you for this great product! HAPPINESS IS CLEAN TRASH CANS! I HAVE TO EXPRESS MY DISAPPOINTMENT THAT THIS IS THE SECOND REPLACEMENT BATCH OF THREE CODE C BAGS THAT DO NOT FIT TIGHTLY AS YOU SUGGEST. WHICH EVER WAY I PUT THEM IN THEY ARE JUST THAT BIT OVER SIZE WHICH MEANS THAT WHEN THE LID IS CLOSED SOME OF THE TOP BAND PIECE SQUIRMS OVER WHEN THE LID IS CLOSED . THIS DID NOT HAPPENED WHEN I FIRST PURCHASED THE BIN AND BAGS! These are great quality bags, and I absolutely LOVE the custom fit (for my particular trash can). The only drawback, is the cost. Price plus shipping is a bit on the pricey side for me, but I still bought them anyway. Thanks for reviewing these liners! To save on shipping, place an order on the simplehuman app for automatic replenishments with free shipping. I ordered the right bags for my cans, but they don't fit. They are too small to fit around the top of the can, as I am sure they are supposed to do. Nor do they stretch. Am I doing something wrong? Thank you for your feedback. We stand behind our products! A product specialist will contact you shortly to assist you. These liners are excellent, strong, and fit well. Would highly recmmend. These are brilliant, not only are they made strongly and fit my bin correctly, they have decent practical draw-strings which work, so I will never have a dirty bin to clean again. Thank you. These liners are great. They fit snugly and are strong. I wish I would have bought a Simply Human system years ago. Ordering is fast and easy with quick shipping. Bravo! I am a caregiver to my mom, and work out of my home, as well. I have tried to find trash bags that would be equivalent to these but I cannot. Other trash bags do not fit well, the lid does not close as well, and sometimes the top of the bag slides down to inside of the trash can. This can be gross. A great fit is most to ensure containment of smells. Looks like I am stuck 4 life. Having the streamlined Simple Human custom bags is just one less stress to deal with. The design of the can is clean, the bags fit perfectly secure inside the lid with nothing showing...makes a very presentable appearance in the the kitchen! I will keep ordering. Thank you as well for the prompt and efficient packaging and delivery. First of all, I downgraded to the smaller size can and my house smells great. I hadn't bought a new garbage can in 12 years and this one seals itself! The 'C' bags are sturdy and top quality. Best decision I ever made. Whilst I found ordering bags for my bin and the delivery excellent I was dismayed that I could find nowhere to take up the offer of money off. This was an offer which came with my purchase. So I now await a response from their customer device department. Thank you for your review, a member of our customer service team contact you directly. When I bought my Simple Human can, I assumed I'd be paying a lot more for trash bags. I was pleasantly surprised when I learned that when ordered in bulk from the SH website--240 code-C bags--the cost is quite reasonable. The can is nice, the liners work well. Here's hoping the can holds up well, but for now, there's nothing to complain about. They fit perfectly! The wife wanted to use grocery bags, or 'something else', but these bags fit and are perfect! And have a drawstring too. Awesome. WHY HASN'T SOMEBODY THOUGHT OF THIS BEFORE ? Impressed! I was unsure about purchasing bags when I can get them free from grocery store. Spending the money for your bags is saving money. I now only have to use the garbage service every two weeks, instead of weekly. I have now bought 3 sizes of bags, none of which fits the can that it's supposed to fit. I've found other uses for the bags. Fits the can perfectly and manufacturer's cost was not more than lesser products found on line. A little thicker and stronger than other bags commonly available. Great product. Good value for the money. We recommend it. Excellent product. So good to have liner bags that actually fit the bin. The bags fit the bin perfectly and are much better to use than shopping bags. They do exactly what the advertising claims. Good design and fit. No leaks - I could fill the bags with sand or cat litter and the bags would probably not fail. The bags fit perfectly and are easy to remove, and no leaks. The only thing I would do to improve them is make them compostable so I can use them in the compost can as well. very pleased with the way the liners fit the can, but we had to buy a new can in order to have them fit. Nice work. I wanted to buy a simple trash can with a closing lid that my dog could not get into, and that's why I bought your can.... I'm disappointed that I now have to buy your liners, none of the liners on the market work with your can ....so, yes, I understand that's a way to drive your sales. But, it's also a way to lose customers, I know I won't buy any other of your products for that reason. Thank you for your feedback. As a friendly reminder, our cans do accommodate generic bags, as long as the liter/gallon size is compatible. Purchasing our liners just ensures that you get a perfect fit. Please note that most of our cans also come with a 'Bag-Tuck' feature which allows you to get a more snug fit if using other store-bought bags. Please feel free to give us a call at 877-988-7770 (M-F 8am-5pm PST) if you ever have any questions about our products. We live in an apartment building with a trash chute and these are the perfect size to drop down that chute. And they are the right size to fill without being around long enough to develop an odor. I can not say enough good about the size and availability of the bags for the can. I have Simple human trash cans in three bathrooms, my kitchen, my dressing area and in my den. They have a nice, clean look and the trash liners fit each one, like a glove. No messy bags hanging over the sides. I buy in bulk because these liners are all that I use on every different can. Love Simple Human!! The code C liners are a perfect fir for the can. It's very nice to not have to tie off or roll extra bag. For some reason the last packs of liners I bought are no longer easy to fit. They are smaller around the top and are hard to get on. This is a great pity because all the previous ones I have purchased have been great!! Thanks for your review. A member of our product support team has reached out to assist you. Simple Human custom fit can liners are as good as their name. They are strong, fit well and are easy to use. These bags are the perfect size for my smaller Simple Human trash can. They are very sturdy and never, ever leak. I have tried using other generic and name brand bags, but these are the best. Love these liners - they fit my can perfectly! They seem a little more snug than the last time I purchased them, but now there is NO liner visible with the can closed. I will always buy my liners directly through SimpleHuman as they ship immediately, right to your door - so convenient! I don't like them, they hang too loosely. I will not buy them again. In fact, I guess we got a few sample bags when we bought the can, and if I had tried them, I never would have bought them in the first place. Thank you for your feedback. A product specialist has contacted you to provide further assistance. Arrived on time, fit the bin so well that I keep thinking that I have forgotten to put the bag in the bin, strong construction and everything stays in the bag -just great! Never knew I could be so pleased with a bin bag - thanks! I purchased liners for my bin. It makes a world of difference to have liners specifically made for the bin, life is so much easier! I like that you can't see these bags when the garbage can lid is closed. They fit perfectly! Better than plastic grocery bags! These trash bags fit neatly inside the inner container. I like the design feature of a small hole in plastic trash liner that allows the bags to fit tightly. There is no messy plastic outside the garbage container. The plastic is thick enough to hold a lot of wet kitchen food garbage. Could not purchase refill liners from Bed Bath & Beyond where we bought the waste can. The store was no help. Went on line purchased what I needed at a better price that BB&B. Arrived just as promised. They fit their trash cans and are strong enough to contain the used cat litter that we use them for. The trash can is perfect in our kitchen, not too small, not too big. And it is nice looking. The trash bag is great because when it is full, just pull it out, tie it and in the big garbage can. Liners do not show when can lid is closed; they fit beautifully and contribute to the neat appearance of the bathroom. Liner is replaced as soon as it is full, and handles close it up well. In short, I love your product!! Absolutely love this product even though it fits rather tight. I use 'C' & 'M' bags. The 'M's fit great. I buy them by the case which last us a year or more, don't dry out (here in HOT AZ), and most importantly -- don't leak. Bags for my Simplehuman bin. I know these are ONLY trash bags but they fit perfectly and perform perfectly, as I have come to expect from Simple Human! Just another, ho hum works as advertised from Simple Human. These bags are fine, nothing wrong with them, quality is fine. They just don't want to stay hidden the way the description says. I may not order these again unless the price drops or I get a coupon or something. If I have to look at the bag anyway, may as well get regular bags at the grocery store and save on shipping costs. Lots of bags - as advertised. Lots of bags, good customer service. these trash bags are the perfect fit for my bathroom wastebaskets. I especially like the fact that you cannot see the bags when the lid is closed. Nothing hanging over the sides. I bought the size trash can suitable for my needs and kitchen space at Target, but was unable to find bags that fit. Simple Human is so smart they put the website and size of the bag in the lid of the trash can, which made ordering easy. These bags hold twice as much as you think they can! They are extremely strong, fit perfectly, and provide a great convenience. Highly recommended! I bought a small garbage can and bags that fit. I live in an apartment and have to carry out the trash. The bags actually hold my trash, close nicely, and biodegrade! I use the can ... and these bags to store my cat's litter 'clumps' until trash day. Since the bags fit perfectly-- and are very strong, they do the job just right. No LEAKS / NO ODORS. On trash day-just tie off the bag -- and toss. The garbage bags fit my garbage container and they hold up well. Online delivery is fast. The liners are a bit pricey, but worth it because the whole point of having a minimal, sleek trash can is hiding the bags! These liners are great. They are very durable and worth every penny! These bespoke pedal bin liners are very practical and useful. They fit perfectly and my wife is delighted with them. 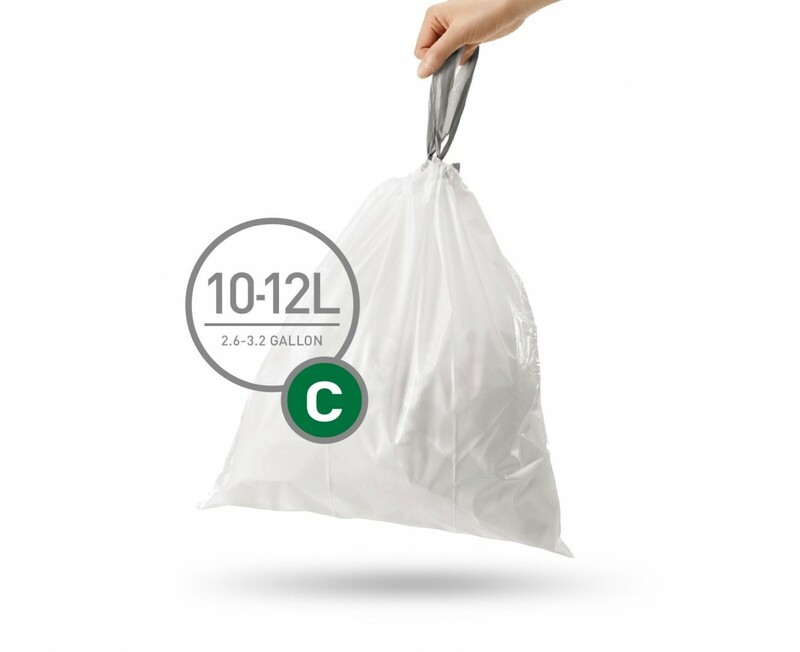 I bought the C size trash can bags to use with my Simplehuman trash can and I really love them. They fit perfectly in the can and you don't notice them with the lid down. They are also very sturdy and hold a lot. I liked the can and bags so much I bough a duplicate can for my cat litter. I would highly recomend Simpplehuman trash products to anyone. Nice appearance, neat and robust, my wife loves it! We love the fit of this garbage bag! We were never able to find anything that fit just right~now we have! I stocked up on these trash bags, which make the cat litter trash can neater and easier to manage. So nice to have bags that fit so well. They don't slump when full, don't sag when have a scoop of nasty litter and don't break when you take them out of the house. I ended up buying another Simple Human can that uses these same size bags. Good product although the last few times I've received my order there are some bags in each individual bag which do not fit my Simple Human can. I wrote about this problem but never heard anything back from Simple Human. I love the trash bags. They are "tailored" to fit the trash can that I bought my elderly father. The inside of the trash can remains immaculately clean-due to the fit of the trash bags. They also enable one to get the maximum use, sizewise, of the trash can. But they fit perfectly and are probably worth the price. the bags fit my trashcan. brilliant! I love how well the bags fit my SimplyHuman trash bin, and the design of the bin itself. Bin liners are not really the sort of thing one can wax lyrical about, so I will confine my comments to your service. Delivery of the 3 packs of liners was an issue for me, but once I emailed Simple Human to alert you to the fact that they had not arrived you could not have responded more quickly and I was most impressed. Firstly, once you knew about the problem you arranged for them to be delivered by courier, AND you refunded the postage cost. Thank you. You are obviously a quality company with a quality service. I found the can liners after trying all manner of grocery store products which were uniformly of poor quality, inflexible sizing, and useless closures. The Simplehuman liners fit, close well, are very sturdy, and can be purchased in larger quantities at a lower price. What's not to appreciate? Everything we use should be made this well at such a fair price. I love the bin with is's soft close action and the bags fit perfectly. The bin looks really good in my kitchen, I use it every day, it's really well made. These liners are the perfect size to fit the can! They fold over the top of the inner, removable bin so they are hidden from view--all you see is the outside of the can, giving it a neat appearance. This is a quality product. I haven't had one break or even leak, and I like the drawstring feature. I would definitely recommend these liners. The baggies are the perfect size for the simplehuman trash can we purchased from Bed Bath and Beyond last fall. They get replaced once a week and are extremely well made. They fit perfectly inside the can in our bathroom with no unsightly edges seen from the top. It doesn't seem important but it is! We bought our simplehuman trash can from Target but they didn't sell the specially made bags for them there. (A sample came with the can.) This may not seem like a big deal BUT having the right liners for these cans makes all the difference in the world. I've even brought some back to Australia with us they are so much better than sticking an ordinary bag in the can. The C liner is perfect for use with the trash can in my bathroom. It holds a lot and is strong. The 20 pack gives me 20 weeks of excellent cleanup. Thank you. The bags are a great fit for the can. I could never find ones that would fit. Simplehuman's handsome, small semi-circular trash receptacle's compact size and design is perfect for that small New York City studio apartment kitchen. It takes up little space but holds a week's worth of a single person's garbage. The trash can liners are easy to use and fit snugly into a removable, washable, tough plastic insert which makes it is easy to fill to capacity. No wasted plastic. Better for the environment. It's so nice to have a drawstring on a smaller bag like I have had in the kitchen for years. So much nicer than fumbling with a twist tie and it encourages me to change the bag in a more timely manner than letting it pile up. I was searching for an easy-to-clean can, sanitary, medium size for bathroom. I love the foot-operated lid, perfect fit liners that seal tightly to contain odors. It is used daily and always appreciated for its good shiny sanitary looking chrome looks. It should last many years because of its sturdy well-designed construction. I wouldn't normally buy special garbage bags--I'm a fan of the reused grocery bag as a liner. But these simplehuman can liners fit the simplehuman can we have perfectly, they are strong enough to hold a load of dirty diapers, and they are a pleasure to use. Easy to open, easy to smooth inside the can, easy to close and tie. And on the simplehuman website we got 30% off a case of them, making it quite economical. The garbage bags are small in size, but they do hold a good amount of trash. Two very significant suggestions: 1. Sell this product in stores that carry your product; it's a total hassle having to order these online, seperately from the container purchase. 2. Offer linings that are made from recycled material, or other more eco-friendly materials. Love these perfect size bags for our kitchen trash. Very strong esp since we stuff them to capacity and then some! The trash bags are functionally super. They fit the trash can perfectly. They are as thick as they should be, and the draw string feature is very useful. The only problem is, they're priced about twice what they should be. The trash bags fit perfectly into my simplehuman trashcan. Like the trashcan and use but the bags received are much larger than the can. Would be more user friendly if more narrow. I am very pleased with the waste can liners, size C. They were a perfect fit and have solved my problem.